Today’s project is a flashback to one of my first jewelry box makeovers that I shared on the blog over 3 years ago! I learned something about me and painting that day… It’s not possible for me to paint 5 jewelry cabinets, 2 necklace holders, a shelf, and a candle holder in 8 hours. Especially when it starts raining and it’s too dreary to even take photos. Because so many people were asking me how I was painting jewelry boxes I was planning to take step-by-step photos. But it was just too dark. I’ve been painting jewelry boxes and cabinets for a little over 4 years now. Many of them have been turquoise. But I’ve painted some white, green, and red, too. I think I’ve distressed all of them and stained a few. I use them to display my jewelry but most of my displays are for sale, too. I really prefer to display my jewelry on vintage or repurposed items instead of the more traditional jewelry displays made of black or white felt. BTW, this one was painted with my homemade chalk paint. 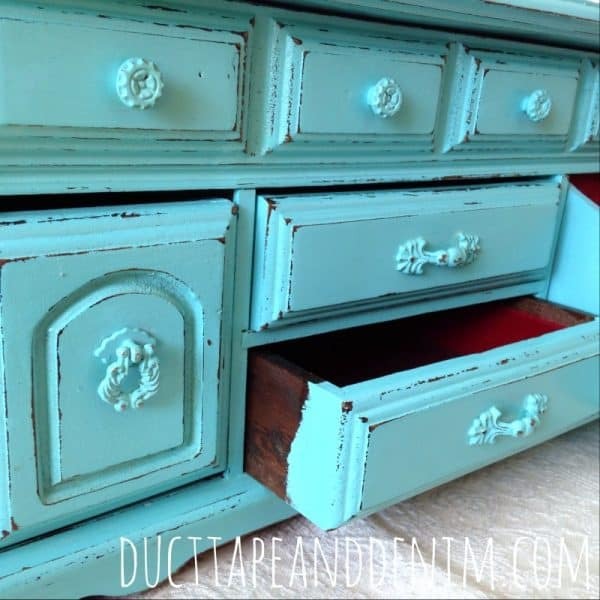 Here’s my homemade chalk paint recipe. One of the good things about doing this for so long is that now friends are giving me their old jewelry boxes and cabinets or buying them for me at garage sales and giving them to me. Bikeman even found one when he was out thrifting without me. Check it out here! It’s the biggest and best of all! BTW, this old jewelry box was given to me by my friend, Karla. She gave it to me one night when we were having a cookout at her house and her grandson loved playing with it. I couldn’t wait to show her how it turned out! First published February 10, 2014. Shared with these blog link parties. I like the color! Looks great! Thanks for sharing with us at Brag About It! Oh my gosh! 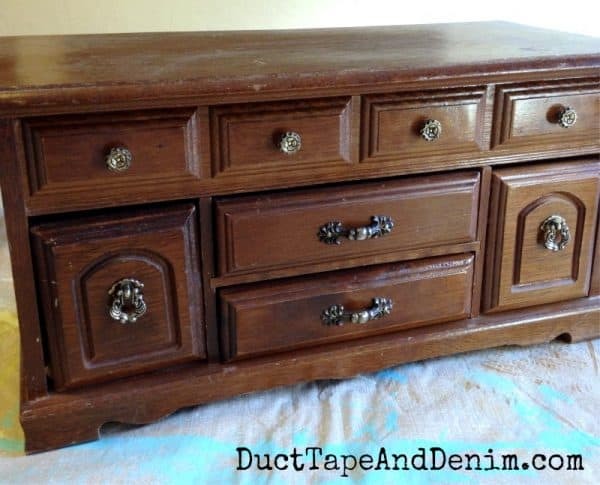 Looks are so deceiving – in the first photos we thought this was a large dresser LOL! 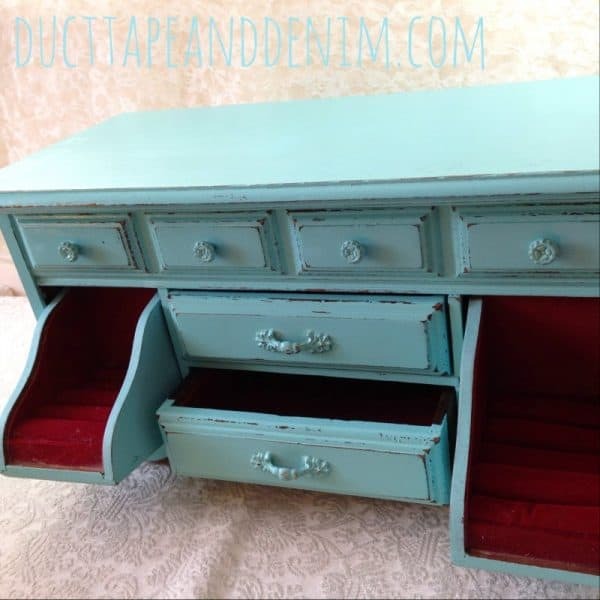 Love the jewelry box makeover – we love the color! Thanks for sharing! 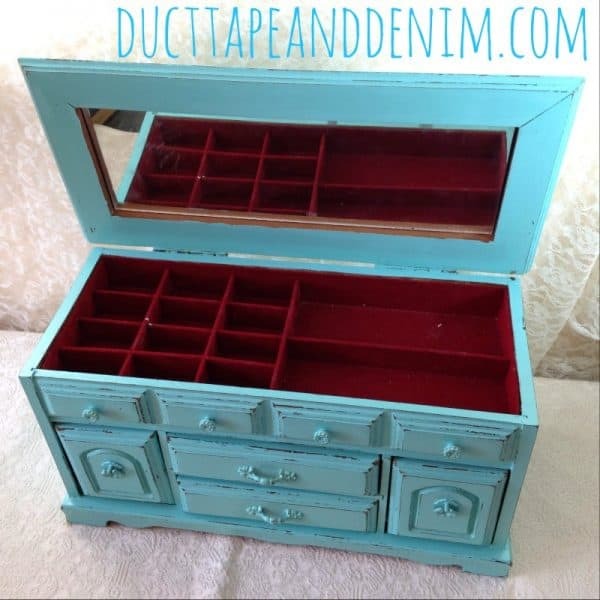 Like you, I love upcycling jewelry boxes – they’re like mini furniture makeovers! I have the identical jewelry box waiting in the queue and the color you painted yours is so pretty. May rethink my original plan on painting it white – thanks for the inspiration! Thanks! Do you have your makeovers on your blog? Leave a link… I’d love to see them! That jewelry box is so cute. Wish I can find something like. Here is a link for one of my transformation. http://www.fabifabu.com/2017/05/17/thrifty-jewelry-box/ Thanks for sharing at http://www.fabifabu.com/2017/05/28/inspiration-galore-project-party-35/ hope to see you again next week. Love it! I have some red paint so you may see a red jewelry cabinet soon! Love this makeover. Thanks for sharing your wonderful posts at Over The Moon Party. Loving the turquoise blue colour! That’s my favorite color to paint!! !